This is the Kratom 10x Powdered Extract Resin from Bali. Extremely pure with consistent quality from batch to batch, crafted from dried leaf and nothing else. This Kratom has been one of the staples here at the shop for almost a decade, and we're proud that our Kratom "Bronze" Powdered Resin is the highest quality we've found anywhere. 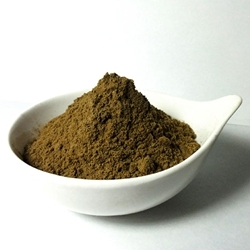 This is the Kratom 10x Powdered Extract Resin from Bali. Extremely pure with consistent quality from batch to batch, crafted from dried leaf, purified water, ethanol, and nothing else. This Kratom has been one of the staples here at the shop for over a decade, and we're proud that our Kratom "Bronze" 10x Powdered Resin is the highest quality you can find anywhere. All of our Kratom is verified authentic by Columbia or Wonderland-Labs, and we only choose the highest quality Kratom leaf and powder from verified sources. Nearly 2 decades in business, we have a wide variety of sources, and only the best sources make it through our strict screening process. Why trust Powdered Bali Extract 10x Resin from anywhere else?